BFAWU general secretary Ronnie Draper yesterday told ASLEF members that strikes work – which is why the Tories have tried so hard to make it so difficult for workers in Britain to take industrial action. Speaking at ASLEF conference in Liverpool yesterday, he said: “People say strikes don’t work. I don’t believe that. Four years ago we had the Hovis strike in Wigan. The company rang me and said: ‘You’ve got to call it off, it’s illegal. We’ll come after you and sequestrate your funds.’. Ronnie Draper, happy, he said, to be ‘returning to my home city, Tory-free Liverpool,’ brought solidarity greetings from the BFAWU. He said: “Remember the crap Cameron, and now May, said about being the part of working people? They’ve given us eight years of austerity and eight years of poverty and a Trade Union Act that hamstrings workers. When I started work, if we had a problem it was ‘out brothers, and sisters, out’. Now we’ve got to give notice so they can prepare to take us on. The Tory Party is not and never has been the party of working people. “McDonalds is living proof that strikes work. Workers now get two weeks’ notice of shift changes and the got the biggest pay rise in living memory. They deserve it. Because the man who runs this global monster is paid $13.4m year! 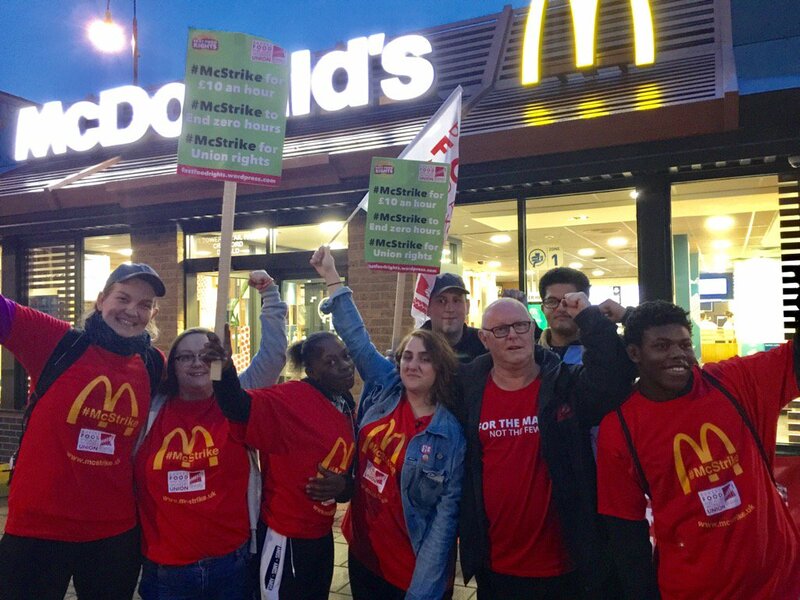 The success of the McStrikes shows what workers can achieve when they organise. Ronnie has been a loyal member of the Labour Party for 45 years – “except for three weeks when I was suspended”.